The Gamma Seal lid permanently transforms your 12" diameter bucket into an airtight/leak proof storage container. Now a bucket can be used for hundreds of household and other storage applications! Simply snap the patented adapter onto your bucket and spin-on the removeable lid. Specially engineered gaskets ensure that the lid and adapter are properly sealed to ensure airtight protection. I have many of these at home and they keep things organized. I have one for cat food, one for my rock salt, one for lawn fertilizer, one for a diaper pail, one on the boat, and a few others. All you do is snap the adapter onto your pail, spin on the lid, and that's it. One quick spin and it's open, closes air/watertight in seconds! No more prying off those difficult lids. The Gamma Seal lid fits virtually any 3.5-7.0 gallon standardized paint/drywall compound plastic bucket (including 20 liter). We also sell the buckets (pails). PET FOODS-Gamma Seals are excellent for storing dog and cat food, feed, airtight and dry. KITCHEN-Gamma Seals are excellent to store food, grains, nuts, sugar. Buy bulk foods and keep them fresh with a Gamma Seal. RESTAURANT/BAKERY-Don't pry lids off any longer. Get quick and easy access to your ingredients, seal airtight in seconds with Gamma Seals. GARAGE-Use gamma Seals to store fertilizer, hardware, rock salt. PAINT-Seal and easily reopen your paint pails with a Gamma Seal. BOATING/CAMPING-Gamma Seals keep things dry and fresh. Store water, or use it to keep animals and bugs out of your things. AUTO-Keep greasy items in their place with a Gamma Seal Lid. Oil, towels, etc. FISHING-Snap a gamma Seal on a pail and you have a leakproof, splashproof minnow bucket that floats. PICNICS-Fill it with ice and you have a cooler AND something to sit on! The Gamma Seal Lid: the raw material used in manufacturing is Formolene LH5206, High Density Polyethylene (HDPE). Gamma Seals and Pails are BPA-Free. 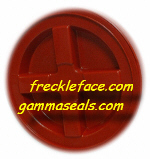 Gamma Seals For Alaska Preppers: Alaskan Preppers Buy Their Gamma Seals Here. 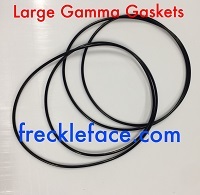 We have THOUSANDS of Gamma Seals In Stock right NOW. Quantity Pricing-The More You Buy The More You SAVE! Red Gamma Seal for 3.5 to 7 gallon bucket/pail. Original Gamma Seals Made In The USA. Patent# 5,207,345. Accept No Substitutes, Buy The BEST! Quantity Discount: Click on the Gamma Lid name or photo to see! 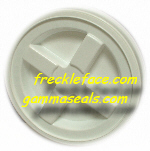 White FDA Approved Gamma Seal for 3.5 to 7 gallon bucket/pail. Black Gamma Seal for 3.5 to 7 gallon bucket/pail. Yellow Gamma Seal for 3.5 to 7 gallon bucket/pail. Green Gamma Seal for 3.5 to 7 gallon bucket/pail. and the large 11.75" Vittles Vault 5.0 Gamma Seal screw cover for a fresh, tight seal. Higher quality than the original. Sold as a 2 pack. Higher quality than the original. Sold as a 150 pack.